Last night, I had the pleasure of chairing a well-attended meeting with the residents of Ancrum Drive – over 20 folk attended on a lovely summer’s evening. I am most grateful to Sharon Bain of Solar Cities Scotland who spoke with residents about home insulation options and PC McKay, who contributed to a discussion we had with residents about the on-going parking issues in the street. We also spoke about speed limits and bin collection matters. I have carried out an initial inspection of this location and from my initial observations there are no sight line concerns exiting Ancrum Drive on to Tullideph Road. When exiting there is a bus stop to the north of the junction which will make reduce visibility whist the bus is stopped for a short period for pick up and drop off of passengers. Vehicles would have to pull in behind the bus until it pulls away. To the south of the junction there are mature trees in the footway which may affect visibility but I will consult with our Environment Department to clarify if there would be a tree preservation order for these trees. I have consulted with our Road Safety Team and there are no records of any safety issues for this junction. I will arrange for a more detailed site inspection … for this junction. Towards the end of 2013, I expressed concern about the Housing Department’s decision to decommission two sheltered properties at the Morven Terrace/Ancrum Place sheltered housing without advising the sheltered tenants or local councillors. Amenity Housing is being considered for a relatively small number of sheltered housing properties that the Housing Department is finding hard to let and is offered (without warden services) to persons over the age of 50. 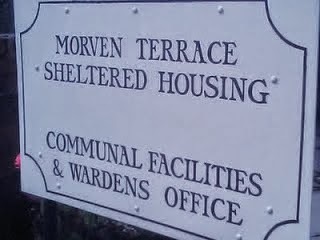 Following a meeting I organised with the tenants at Morven Terrace/Ancrum Place that senior housing department also attended, there was a view from tenants that there is a need to exhaust all possibilities to get new sheltered tenants before any conversion to amenity housing. 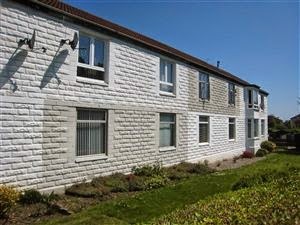 These included clarity on the right of existing sheltered tenants aged under 75 to their sheltered TV licence, the position regarding council house sales and amenity housing and the possible viability of providing external lifts to the first floor properties at the Morven Terrace/Ancrum Place sheltered housing to make the upstairs flats more accessible [and therefore attractive] to sheltered tenants. The costs provided by City Architects are based on tender rates for similar works for recently competitively tendered projects. These are substantial works including the need for 6.5m high rendered blockwork lift shaft, foundations and pit for the lift motor, the new lift shaft would have a mono pitch timber and single ply membrane roof. Allowances must be made for integration with the existing stairwell and the existing access deck at first floor level. Alterations to the existing access deck would also be required. Within the cost there is an allowance for a new three phase electrical supply required to power the lift, also links to telephone line and fire detection. An allowance has been made for contractors preliminaries i.e. site set up and ongoing site running costs based on current pricing. An allowance has also been made for contingencies to cover unforeseen costs which is standard estimating procedure. Design fees etc must also be included. In addition to the installation costs there would be significant ongoing running costs associated with lifts including health and safety monthly maintenance visits, emergency call out response and reactive maintenance. There is no capital or revenue budget provision for such works. These are significant costs. Given that there is an overall surplus of sheltered accommodation within the City, from which the needs of those requiring sheltered housing can be met, it seems it would be difficult to justify such expenditure. I have replied to the Housing Department stating that over £70k per block appears ridiculously high and the council should be seeking alternative quotes from the private sector. The department has now agreed to do this and I will keep the tenants of Ancrum Place and Morven Terrace sheltered housing updated as I hear further from the department when alternative quotations are received. Residents have pointed out to me that the private stretch of roadway up to the lock-ups off Ancrum Drive is very badly deteriorated. I asked the factors on behalf of owners Northern Housing Association if the worst of the potholes can be filled. “I am trying to have works authorised and carried out. Once I know what action we are to take I will let you know. This morning, along with two of my ward colleagues and City Council officers, we had a useful discussion at Dundee House about the parking problems residents in the Ancrum Drive experience. Having already held a number of meetings with the residents of the street and organised a walkabout with residents and Sustrans, the sustainable transport charity, around the area, it is clear that there is a real issue to be tackled. I made a number of suggestions this morning about possible additional parking off-street and involving the local residents group Community Spirit Action Group in terms of moving things forward. City Council engineers will also undertake some survey work. 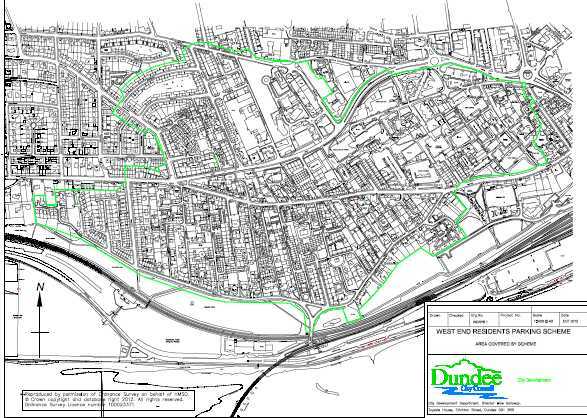 Also today, Dundee City Council finally got round to launching the consultation on a possible residents’ parking scheme for part of the West End – primarily the area round the Perth Road shopping area (and slightly wider) and as far north as around Blackness Road. The plan below indicates the area covered by the consultation. You can download a higher-quality PDF of that plan here. Improving residents’ parking is an issue I have campaigned for for many years. 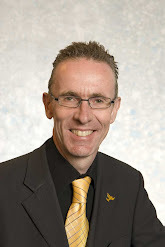 As the Planning & Transport Convener in the previous council administration, moving on from a report by Buchanan transport consultants in 2008, it was my intention and that of the previous administration to move swiftly to consult with residents on detailed proposals to improve parking in West End given that the Buchanan report indicated there was real difficulty for residents getting parked and possible support for some form of parking scheme. The current administration that took over in early 2009 has moved with all the pace of a snail on taking the matter forward but – more than three years late – at last there will be a public consultation on proposals about the parking issue. I would urge residents to take part in the parking public consultation. 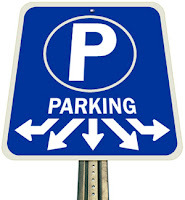 There is no magic simple solution that will resolve the parking problems many in the West End face but getting the views of all local residents and businesses will be vital in terms of bringing forward solutions that the community feel will be of benefit. 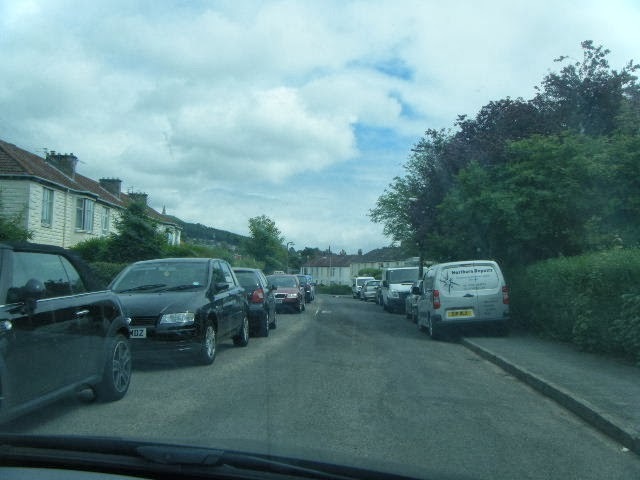 A key issue will be cost – I cannot see West End residents accepting an £80 annual charge when Menzieshill residents are charged only £5 a year – clearly equality in parking charges across the city is required. 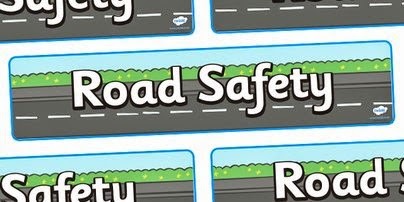 The information given to councillors today about the consultation had some confusion in e-mail return addresses (2 different ones – westendresidentsparking@dundeecity.gov.uk but also westendresidentparking@dundeecity.gov.uk) and a web link error on the questionnaire that is going to residents and I requested to the City Development Department that these be urgently resolved. “IT have confirmed that both email addresses are live and can be used for this consultation exercise. Yesterday, in addition to visits to constituents, I took part in a walkabout round the Logie Estate with council officers from various departments and a ward colleague to look at issues in the area. 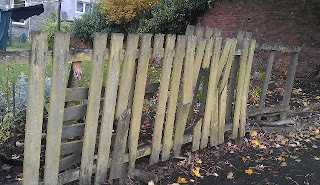 An example is damaged fencing (see right). It was good to welcome the Director of Housing to the walkabout on this occasion. Thereafter, I enjoyed a very well-attended general meeting of the Pennycook and Sinderins Courts Residents’ Association at which we discussed numerous local issues including parking, noise and the Association’s forthcoming Christmas Coffee Morning, taking place on Saturday 24th November, as part of the West End Christmas Fortnight activities. I also attended a committee meeting of the Jericho House Support Group and am pleased that Jericho House will be taking part in our Christmas Fortnight Community Fayre Launch on Saturday 17th November. Over 20 community groups, charities and other organisations are taking part in the Community Fayre at Dundee West Church (10am to 12 noon) and it will feature other activities including face painting for the children. Later on, I had a very useful site visit in Ancrum Drive to look further at possible parking improvements there and in the evening I attended the Blackness Primary School Parent Council meeting. At the Parent Council, there was a very interesting update from Mr Ferrier, Head Teacher, on school building improvements that have recently taken place and a number of school initiatives planned for the new term, including science workshops and co-operative learning for staff. There’s also a new P5-P7 athletics club which is a really good new initiative for Blackness Primary School. Yesterday, I also took part in a site visit I had organised with Sustrans, the sustainable transport charity, to the Pentland and Ancrum Drive areas. Two representatives from Sustrans, along with a good-sized group of local residents, representatives from Community Spirit Action Group and myself met up to look at possible ways of tackling some of the issues in Ancrum Drive and Pentland – road safety, parking, traffic calming, etc. Sustrans in Scotland has done some really good work as pilot projects on this type of issue in both Kirkcaldy and Elgin, so their input and advice is really helpful in terms of tackling residents’ concerns about parking and traffic/safety issues in Ancrum Drive and the Pentland area. I’m most grateful to the Sustrans representatives for attending yesterday and to the many residents who came along and gave their views.